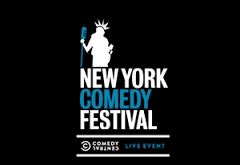 The New York Comedy Festival is in full swing with a special treat this Friday in Brooklyn -Comedy Central Live in Brooklyn at Kings Theater featuring Hannibal Buress with Performances by Nathan Fielder, Jay Oakerson, Oh, Hello with Nick Kroll and John Mulaney, Jeff Ross, Roy Wood, Jr. and more! Comedians Trevor Noah, Kathy Griffin, Margaret Cho and Bill Burr are among the heavy hitters at this year's festival. For more information check out http://nycomedyfestival.com/.